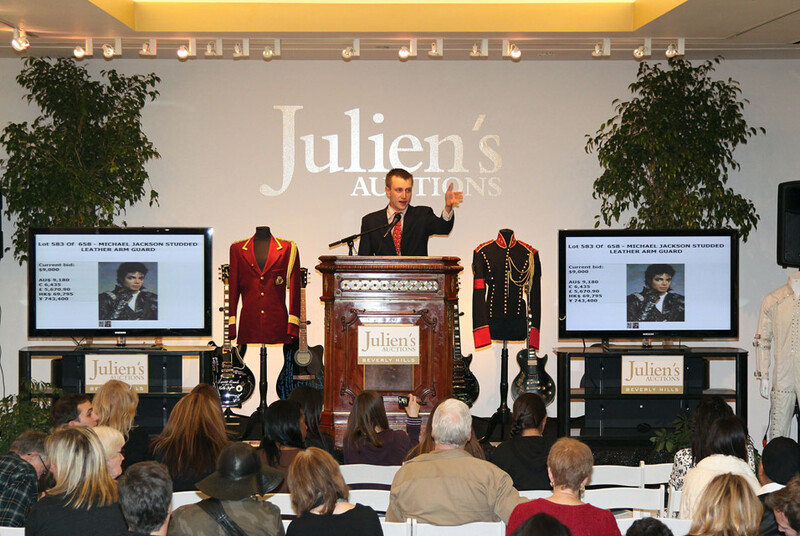 Auctioneer Michael Doyle auctions Michael Jackson memorabilia at the "Icons and Idols" at Julien's Auctions in Beverly Hills. A lone glove worn by Jackson during the "Bad" tour in the late 1980s sold for $330,000 at the auction Saturday. A jacket signed by Jackson brought in $96,000 and a fedora he wore on stage went for $72,000 at the Julien's Auctions event. AP Photo/Julien's Auctions, Shaan Kokin. BEVERLY HILLS, CA. (AP) .- Items from the Michael Jackson's stage wardrobe, including one of the King of Pop's famous gloves, attracted furious bidding at an auction of celebrity memorabilia in Beverly Hills.